This is the first in a series of articles I’m calling; Truthful Facts About Growing Pot Indoors. I’ll be posting them over the next few weeks. I love to read your comments and answer questions. Please use the comment section after each page or article. Thanks!! It’s a great idea; grow your own and save some money, you’ll know exactly what you have, you’ll know how it was grown and you will save some of your hard earned cash in exchange for a little labor. The problem is how long it takes to get your first crop versus just running to the store (or finding the weed guy) and buying a bag of weed whenever you need it. The answer is to buy enough reefer to get you through the 147 days you’ll need before you can smoke your pot. You can start your first grow from seeds or a female clone. 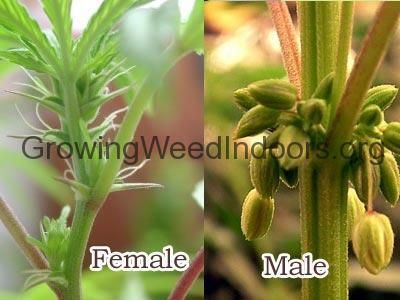 NOTE: I don’t use feminized and/or auto-flowering seeds. I’ve tried to grow them before and had terrible results and don’t recommend them. Those types of seeds will save about 3 weeks of grow time but I’d rather run out and buy a bag then grow auto or fem seeds. The plants are small, the buds are small and half the plants will morph right away. Plus you can’t clone the plants which is a real deal breaker. Seeds take from a couple of days to around 12 to sprout. Once they sprout and grow for a few weeks in a peat ring, they are ready to be transplanted into your large pot. I suggest 6 or 7 gallon pots but use whatever fits your grow area. Read this article about pot size. Once they are transplanted, start the flowering cycle (switch your lights to 12 hours on and 12 hours off) to find out which plants are boys and which ones are girls. It can take up to 15 days or so for the girls to show themselves. Once that happens, you can toss the male plants and switch the girls back to the vegetative light schedule you’re using. Once you find your girls; they will have tiny wisps of white hairs and you’ll see tiny little buds starting to grow, boys will show little ball sacks, move the boys out and revert back to the vegetative cycle (GLR or 18 hours on 6 hours off), and let them to grow for another 50 days than they’ll be ready for flowering. When plants revert they will grow a few odd shaped leafs through the flowers. They don’t hurt anything; you can snip them off or let them grow out. Restart the flowering cycle by switching back to the 12 hours on 12 hours off lighting schedule. Of course depending on strain, your flowers reach their full potential and size when the trichomes start turning amber in from 45 to 60 days or possibly longer. 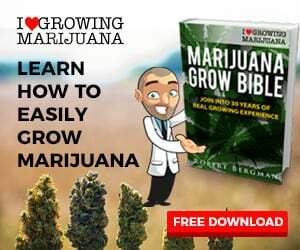 NOTE: the time frames listed are approximate and are dependent on the strain you’re growing, the grow environment and your skills as an indoor gardener. For example; not adhering to a strict light cycle of 18 hours on and 6 hours off. For the best grow, you want the lights the same every day and you MUST refrain from disturbing your girls when the lights are off. Just let them be. 60 days in the flower cycle. Total = 147 days for your harvest. You’ll also need another 14 days to dry and cure your buds giving you a total of 161 days. You can cheat a little and pick young small buds but before you know it you will have smoked the whole plant. A good way to dry fresh bud you want to sample is using a portable oil heater. Read the full article about drying wet bud here. There are many more tips and tricks about growing your own pot at Growing Weed Indoors. Soil mix, nutrients, lighting schedule and equipment used to grow awesome pot; the kind of pot where you’re feeling it after one hit from a one hitter, are fully explained. Growing marijuana is a whole lot easier with a little help from people like me who actually grow weed indoors at home. This is an important fact when reading or watching how to grow articles and videos. Is it really from somebody with a stealth grow or somebody just trying to sell you something? Love to hear your comments and answer any questions. Please use the comment section below each post, page or article.